I first used the DiSC assessment years ago when I was working at a church in Phoenix, Arizona. Our church hosted a workshop and one of the speakers led us in this personality assessment. Since then, I have used it multiple times and with multiple teams to help me discover more about who I’m working with and how to lead and/or work with others best. Depending on which DISC test you use (there are a few variations), it will tell you how you respond to certain situations. It’s really more of a behavioral predictor (according to some) than an actual personality test, but it will tell you a lot about both. There are a number of things I like about this behavior assessment over others. It has really become one of my go-to assessments when working with teams or even individuals. I even use it on the fly when dealing with colleagues or leaders (and I’ll explain how and why momentarily.) Here are a few of the benefits of DiSC that I see. The DiSC assessment takes no more than 15-20 minutes for the full profile. Again, this can vary somewhat depending on which specific assessment you take. I’ve also seen facilitators do a “quick” version of this profile technique in about 5-10 minutes (or less). I’ve worked with a number of personality tests and used them for students, leaders, and myself. 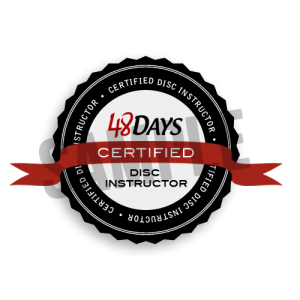 There are some that are great and may go into more depth than the DiSC; however, I don’t think any are easier both to use, understand, and teach others to use. You learn 4 letters, and each letter corresponds with the type of personality associated with the letter. D stands for “dominant”. These are your Type-A people who fall into the natural leader category. They are driven and determined. I represents the “influencers.” These are your everywhere-and-everything-is-a-party people. They are outgoing and love to be around a crowd. S represents the “steadiness” personalities. These are the nice people that are very supportive. They are the encouragers and your loyal friends. This is where it gets FUN! 🙂 Once you get the DiSC assessment down (it doesn’t take long, remember, it’s easy! ), then you can begin to use it to improve communication for your team, family, friends, etc. It gets a little addictive to begin to see people in a different light. Here’s the thing: when you know how people behave in certain situations (or in general) you can drastically begin to improve your communication with them. You can vary your communication style depending on who you’re talking to. Do they need the big picture or a lot of detail? Do they need to know who’s coming or what the agenda will be? Will they need to know how productive it will be or how much fun they’ll have? Who can lead a team? Who can hammer out the details? Who can get everyone at the meeting or function? Who can make sure all feel valued and cared for? Can you imagine what you’d get done? Can you fathom what your team would get done? Feeling appreciated and understood. Feeling like you really know them and listen to them. One significant way to build trust with your team mates is for them to know and feel that you understand them and can relate with them. The DISC test helps by showing you what each person needs from you and one another in areas such as leadership, communication, work environment, and more. Trust grows when you feel safe and know what to expect and what is expected from you. As a leader, it is important to know how to relate to each of your team members. Imagine a work environment where you felt understood, appreciate, and valued. Your team leader gives you just the right balance of freedom and direction. You have open and honest communication with your manager and you feel comfortable sharing ideas, concerns, and asking for clarification if needed. How productive do you think this team would be? You can also build on the DiSC assessment by using Strengthsfinder 2.0. This profile allows you to identify the top 5 strengths of each of your team members. The identification of these strengths can then be used to align people into their giftings and further increase the productivity (and satisfaction) of your team. Collaboration and employee engagement go hand in hand. The better your team collaborates, the more engaged they will be and the more they will enjoy working on your team. It’s hard to communicate as it is. What if you could simplify that process and make it easier for you to communicate with others and for them to communicate with you? Each personality style communicates differently and understanding others and how they communicate will increase your communication strategy exponentially. Have I convinced you yet? It really is a quick and easy way to improve your leadership and develop your team. I’ve recently switched to PeopleKeys for all my DiSC assessment needs. They’ve been great to work with and their selection of assessments is amazing! This certification is through 48Days and Dan Miller. I highly recommend all of his products and training. They are top notch! What has been your experience with the DiSC assessment? What other ways and assessments do you use with your team? Let me know in the comments below? Disclosure: Some of the links above are affiliate links, and if you decide to make a purchase I will earn a commission at no additional cost to you. Please know that I have experience with all of these companies, and I recommend them not because of the small commissions I make if you decide to buy something but because they are helpful and useful, . Please only spend money on these products if you feel you need them or that they will help you achieve your goals or your team’s goals. I had the opportunity recently to work with a young man who needed some leadership development coaching. His boss had strongly encouraged (read required, actually – ahem) him to go to three sessions and then any sessions after that were voluntary if he wanted to continue. We ended up meeting for seven or so sessions and during those sessions discovered a lot about who he was and the leader that he was growing into. For a coach, those are some of the best moments. You know your client is “getting it”. They are tracking with you and are thinking differently. That’s when change can start to happen. Something clicks within your client and they begin to make progress. For some clients, it happens very quickly. For others, like this young man I worked with, it happened towards the end of our time together. The other sessions were helpful and useful; however, we had one session where it seemed like everything was firing on all cylinders and we were having one breakthrough after another. As I reflected on some of my best coaching sessions (and this one), I thought about the why. Why did that session go so well and others haven’t? What made that session so special? If you are going to coach someone, you need to use your strengths to their advantage. Some coaches like to coach over the phone. Some like to coach in person. I like to coach in person. I’m a very visual person, so I like to both see who I’m coaching and also write things down for both of us to see. I like whiteboards. During this session, I used the whiteboard extensively to help my client make connections (I’ll talk about more in a minute) with his past employment and his future career goals. In writing things down, he was able to make connections that he hadn’t seen before in how his whole path was essentially leading him to where he wanted to go. Learn to use your strengths as a coach to have even more impact with your coaching clients. I’m a visual person (one of my strengths) and love to use whiteboards to draw and write. I’m a strong believer in writing things down (whether it’s goals or brainstorming, etc.). It’s easier to see connections when you have something written in front of you. As I was meeting with my client, I wrote some things on a white board based on a question I had asked (about his former employment). We wrote those things down and then continued to identify different characteristics of jobs that he had held up until his present one. As we were going through this process, you could see the light bulb turn on as we connected the dots and discovered that every job he had held had prepared him not only for the job he was currently at, but also for the career path that he was heading down. Leading clients to discovering connections for themselves will help to create more breakthrough moments in their coaching experience. Whether it’s what question to ask next, what homework assignment to give, or what activity to do next, coaching is a lesson in flexibility and judgment calls. Coaches need to be able to trust their intuition in order to move clients forward. Often there’s this gut feeling that says “go this way,” “ask this question,” or “do this activity next.” There are times when it seems like the activity may not fit or the question seems a bit off; however, the times I have followed my gut have been far more effective than trying to force an activity that I had planned or trying to follow a rigid structure. Learn to listen to that little voice when you coach others, and you will quickly become a stellar coach. When you’re first starting off coaching, this one can be quite difficult. It was for me. At times, I still struggle with it. There’s a difference between consulting and coaching. Consultants give advice and tell people how they think certain tasks and goals should be done. Ask powerful questions and be quiet. Listen to what your client has to say. Don’t be afraid of silent space during the coaching process. These four strategies are not the end-all be-all to coaching, but they have helped me lead others to their a-ha moments whether as part of a team or individual coaching. What other strategies have you used to help lead people to “a-ha moments”? Which strategy do you tend to employ the most? Let me know in the comments below. I’m a big advocate and proponent of customer service. As in a huge believer. Ever since my mid-20s when I worked in a retail store called Eastern Mountain Sports and went through some phenomenal training, I am sold out on quality customer care and training. Unfortunately in this day and age, well-done customer service is hard to find. Sometimes, next to impossible to find. Several weekends ago, I was traveling with my family back from a wonderful weekend filled with friends, family time, and fireworks. We had stopped in a 7-Eleven to gas up and get a snack for my son. My wife let him get 2 candy bars because the sign said they were 2 for $2. She specified that he could only eat one (which he did not, by the way, but that’s another story for another time!) and this is an unusual treat for my son. When I went to check out, the checker told me the total, and seeming a little high, I asked if the candy bars had rung up at 2 for $2. They did not, he said, so he proceeded to ring them up again. This time the total was 9 cents cheaper. I still didn’t think that was right, but went ahead and paid him. “So are you going to honor the price.” My voice at this point was probably noticeably agitated. At this point, one of the other customers, hearing the exchange asked if there was a manager available. The employee only shook his head no, not even looking at this woman. At this point, I needed to step away. One, because my son was standing right there, and this was not one of my finer moments. Two, because I needed to cool down before laying in to that employee like I so wanted to do. It was at this point that I really wanted to throw something at him more than a verbal sparring match. I refrained however, and went back to the car and left the store. I vow never go back to that store again and likely will avoid all 7-Eleven stores from now on – not to be vindictive or spiteful but to support stores who care about their customers and treat them with a sense of value. How could this have been a totally different outcome? There is always something you can do if you are focused on the customer. What lessons can be learned from this exchange? 1. Treat your customers with respect. What can you do today that will scream, “I care about you, the customer!”? 2. Give the customer what they want. The companies that will excel in the future are ones who will not only deliver for the customer, they will over-deliver. Sometimes it’s a simple solution; however, at other times, the solution might be a little more complicated. Bottom line – keep your customers happy. How can you over-deliver for a client today? I don’t know how long this young man had been working here, but it was obvious he didn’t like it. Or maybe he was having a bad day. I don’t know and frankly, it doesn’t matter. When you’re in a customer service position, sometimes you have to fake it. Put a smile on your face. Be friendly. Act like you care (even if you don’t). People respond way better to smiles and friendliness and it will make your day go much better as well. How can you level up your friendliness today? 4. Train your people right from the start. Again, customer service training is key, and either this employee didn’t care to heed his training, or he wasn’t trained. Regardless, he didn’t need to be working that day. Also, in working with a lot of millennials, soft skills are a necessity that don’t get a lot of attention and training. As a rule, most young people lack these kinds of skills and must be trained in them. Don’t assume everyone knows about customer service. Have a specific training plan and take all of your employees through it. What is your plan to train your employees in customer service? 4 Quick and Easy Ways to Make Someone’s Day. #3 is so important! You’ve probably heard the saying. You may have even said it. I think it’s quite funny. It’s probably just my weird sense of humor, but sometimes I just can’t help myself. I know what the saying means, and what people who say it are referring to. There’s no room for selfishness when it comes to being a part of a team, just as there’s no space for egotistical and narcissistic behavior. I’m sure you’ve worked with people like that, as I have, and it makes for a very tough work environment. All teams are made up of individuals, and there is an individual responsibility to make the team work. What, then is an individual’s obligation to the team, and where does individual effort come into play? Here are several things that make a team player effective. A leader needs to set a clear and compelling vision, but the team members must buy into that vision, and know that the success of the team is dependent on their commitment to it and their work towards it. Team members buy into the vision and dedicate themselves to knowing their role in the vision and doing their part to accomplish it. Part of what makes a great team is a willingness on the part of team members to really serve each other. It’s amazing to be a part of a group that serves each other – not out of selfish motives or a “payback” attitude, but just out of a desire to see the team function well. Teams who have members that function like this grow an atmosphere of trust that yells, “I’ve got your back!” It is evident not only to the members of the team, but to everyone this team comes into contact with. This is similar to the characteristic above, but goes a step further. You can serve someone without helping them succeed. I believe team members should be each other’s biggest cheerleaders. Often, we get into this competitive mode (which can serve its purpose), but more often than not it keeps people from collaborating effectively. Seek others success, and you will be a success. Find ways you can really help others succeed. Go the extra mile to assist your team mates. I’m a big proponent of strength-based work theory. There’s too much to go into in this blog post, but the main premise is that people do better when they work in their areas of strength and minimize their work in weak areas. (As opposed to focusing on improving weak areas). There are plenty of personality and strength assessment tools to use. One of my favorites is the StrengthsFinder 2.0 . It’s a very quick assessment that shows you your top 5 strengths out of 34. Based on the results, a leader can shift team members around to work in their area(s) of giftedness. Check out the Team Building Resources page for more personality assessments and strength assessment resources I recommend. Everyone needs help at some point. No one person can do it or know it all. When I was working with students at a high school, we would talk about their grades and if they needed tutoring, I would tell them, “Don’t suffer in silence.” Meaning, there are plenty of resources for help. There’s no need to suffer. The same is true for a team. Even if you’re not part of a team where everyone willingly helps each other out, you probably know someone who has the answer or resource you need to be more effective. Don’t be afraid to ask. The strongest team players that I’ve worked with do not need to be told to learn. They are constant learners and are self-directed in this area. You can tell the “hungry” team mates from those just wanting a pay check or recognition. Typically, they are quick to take the credit and last to do the work. Interesting, yes? The hungry learners ask you what they can read and do and the best way to grow. They see you as a mentor and are also hard-workers. They know their strengths and also know where they need to grow. They might now always know how to do something or how to improve, but you can tell that they want to and that they are loyal to the team and to you. These are the ones to pour yourself into and invest in. It will pay off huge dividends! If you work on these, then you will be an effective “I” in the team, or “me”, whichever you prefer! 🙂 And, hopefully, we can change that saying together! What else do you see as an effective characteristic of a team player? What area does your team need to work on? Let me know in the comments below. Trust is one of those bedrock components of any team. It can be hard to build but easy to break down. There are a lot of ways to build trust, and endless ways to breach it. It was a great thrill and a rush of adrenaline. We got through the whole half-day without anyone falling out and having a blast. Here are the team building lessons I learned from our experience.